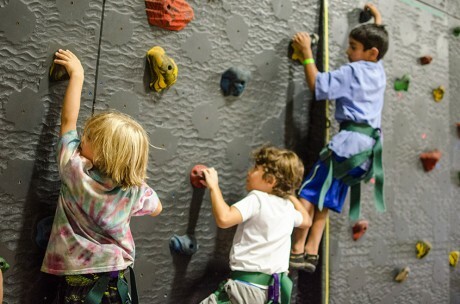 Sam explains that kids as young as 5, known as the “High-5” program, can begin to participate in low elements, while Middle Campers can choose the climbing wall or mid-level rope elements as an activity during their camp day. 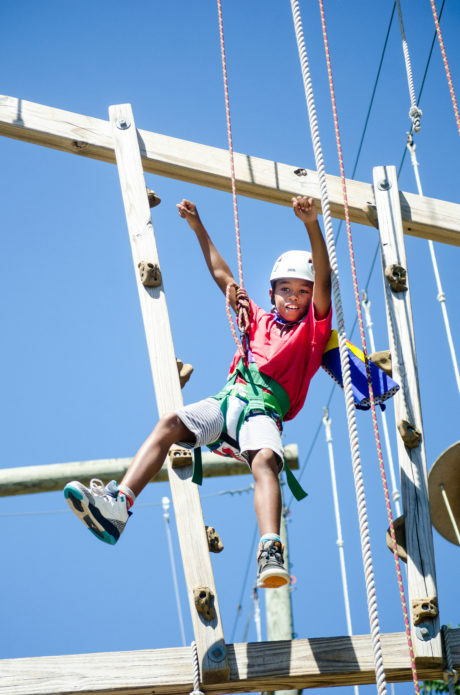 Upper and Senior campers can opt for the ropes course as part of their elective menu. 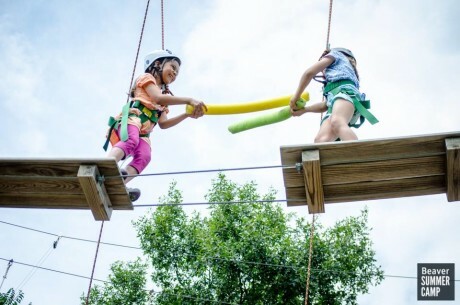 With high ropes climbs such as The Centipede, Vertical Playpen, and Catwalk, there is no shortage of exciting opportunities for campers to tackle new challenges! Today was a particularly exciting day on the ropes course, where the Senior Camp morning elective had the opportunity to be the first campers to climb a new high ropes element called Tarzan! To complete Tarzan, campers first climb a ladder to a platform, then traverse across a high wire to a second platform, stabilized only by ropes hung about 10 feet apart. Transitioning from rope to rope requires courage and strategy! We interviewed senior camper Matt who was the very first to climb the course! “I was nervous at first because Tarzan is up so high! And the first rope seemed a long way from the platform. But once I got going it was SO much fun!” When asked what advice he would give other campers who also wanted to try Tarzan, Matt encourages them to “believe in yourself, you will be nervous but feel accomplished in the end!” Then quickly adds “but whatever you do, don’t look down!” Matt exclaims that Tarzan is the hi ghest up he has ever been on the ropes course! “Don’t be discouraged!” says Clara, “It is a great way to build confidence in your abilities!” With something for campers big and small, we recommend everyone give Adventure Challenge a try!